Charley Farthing is on the run. 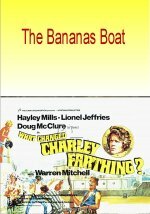 Chased by an irate husband with murder on his mind, Charley finds himself hopping on a ship, chased by authorities on a politically turmoiled island and forced to skipper an old ship all the way to Ireland! But what would happen if a ship were to come along and rescue them?